Have a good time, but remember; there is danger in the summer moon above. Will I see you in September, 2014, or will Scott Lobdell and Scott Kolins lose you to DC Comics' tale of Red Hood's Outlawless potential future?! Bye, baby, goodbye. Well, we're in the future again. Specifically, we're in a future five years from now, which may or may not be the same future as the ongoing Futures End weekly title. 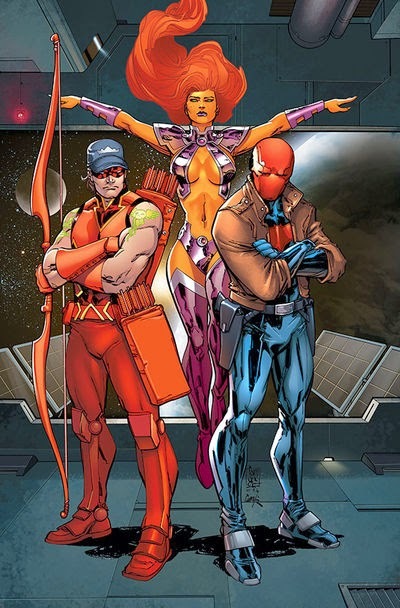 A future in which Roy Harper has joined the Justice League (for reasons covered in the Futures End weekly) and Koriand'r has returned to Tamaran to assume her throne (for reasons thus far not covered), leaving Jay-bird all by himself as the Last Outlaw Standing. Though is it possible for a comic to be both incredibly exciting and interesting and infuriatingly stupid at the same time? I think our friendly neighbourhood Scotts have managed to do just that. But be forewarned; if you're not cozy with stories full of ambiguity, then you're not going to have a good time here. This is an old school, take no prisoners, punish the wicked type of Red Hood. He's not reacting to Batman, or Ra's al Ghul, or Talia, or Ducra -- he's just Red Hood, all on his own, doing what he does best. And, to borrow a phrase from the competition, what he does best isn't very nice. There's no Kori and barely any Roy involved. We're all up in the 'Red Hood' with him. This story -- such as it is -- only works because it's mostly monologue. Jason is talking to us, the readers, not just rumbling things over in his mind. He's showing us where's he's at and giving us the backstory to how he got there. There are no regrets; just facts, for us to take at face value or read more in to if we so wish. But then there's so much to 'read in to' with this stand-alone adventure. I've been fairly dismissive of all the Futures End one-shots that don't tie directly in with the weekly series (which is most of them), but there have been some standouts. Initially, I didn't think Red Hood was one of them, but having read it a couple of times now, I am finding myself liking it more and more. This is not a grand cosmic adventure or a thrilling detective tale -- it's a straight up character study. This book could be set in any time frame with any continuity and -- with a few minor tweaks -- work just as well. This is how Jason sees himself, flaws and all. And that makes for a pretty damn awesome comic. I'm afraid I'm not a big fan of Scott Kolins in this book. Maybe I've just gotten too used to RB Silva's work, but while Kolins style worked very well in the absurdest romp that was Larfleeze, it feels a bit too indie for Red Hood. That said, he has some beautiful shots like the opening page of Jason sitting in his urban foxhole with the damaged hood in the foreground. But something about his style just doesn't quite jive with the narrative. This story works because of the text. The art doesn't detract, but it would be just as good as a short story. Plus, at one stage of the plot the art is just downright confusing. Unlike every other New 52 title which uses banners like “Last month, Cairo” or even simply “Earlier” to indicate a flashback sequence, this issue is all Jason talking to us, and we're supposed to use “But not that long ago” and a ghostly floating Red Hood to know that the scene with Roy is a flashback. It appears that Roy wants to stop Red Hood from taking a hovercraft with “RH” painted on it because the Heroplex needs it -- yet only on flipping back a page is it apparent that Jason was carrying a small glowing box as a large Avengers-like helicarrier named GW Bush (presumably the Heroplex) falls out of the sky. 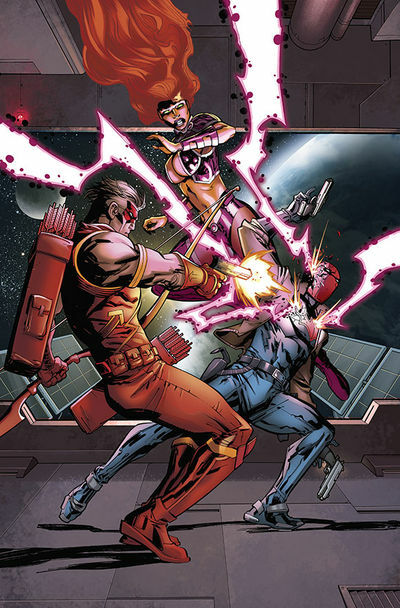 My only complaint with the story side of things -- assuming you can roll with the ambiguity of how we got to where we are and the fact that there's not really a story going on -- is that recent issues of Red Hood and the Outlaws and other titles have been playing up the term “Outlaws”. It is written with a capital O. Wonder Woman tells Batman to call up the Outlaws. Jay, Kori, and Roy call themselves Outlaws like, well, like the Teen Titans call themselves Titans. And yet now, or, rather, five years from now, Jason tells us that “We were never officially a team” . . . make up your minds, guys. It's certainly not very sophisticated, but then again neither is this story. The theme song to Jason's mission to take out the trash is this classic diddy from Ice T -- before he was known to a generation as the voice of talking kangaroo in Tank Girl (and of course Ramrod in Batman Beyond), yet after he was known to the moms of a generation as the reason to put 'parental advisory' labels on records. Remember records? Yes, ladies and gentlemen. It's Body Count, off their debut album Body Count, with the hit single Body Count Anthem. For this comparison we're going to stick with the fact that this issue is a character study of Jason Todd. More specifically, we see how he sees himself, both the acknowledged lies/suppositions he tells himself and the misrepresentations we, the readers, know or suspect based on past stories. 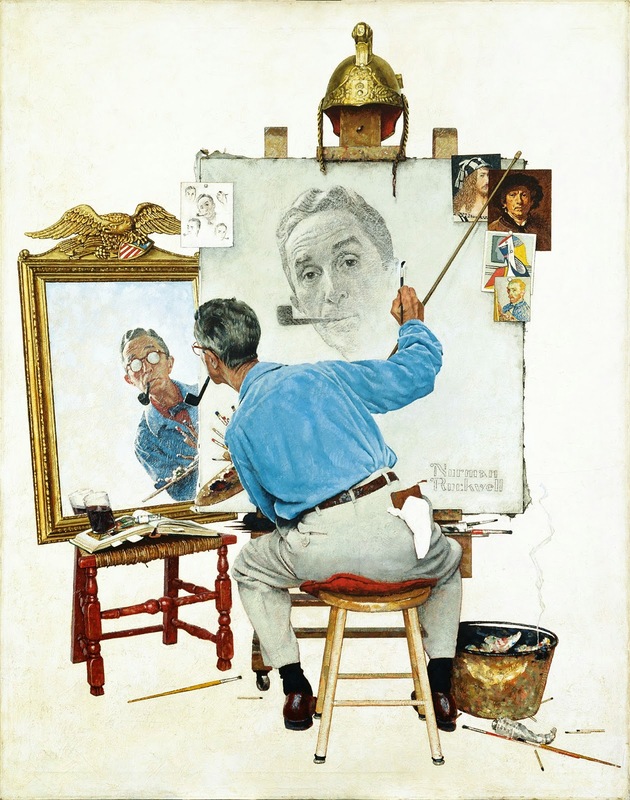 So it's sort of a Triple Self-Portrait, much like Norman Rockwell's painting from the February 13th, 1960 issue of The Saturday Evening Post. Remember that ambiguity I mentioned earlier? In all the Futures End one-shots, we've jumped ahead and skipped over changes in the characters' lives. But typically we get hints in to some key event that changed things. (To stay with the Bat-family, look at Batwoman turned vampire. How Batgirl is widowed on her wedding day. Or Batman's back being irreparably shattered). For Jason, we know Kori left earth, and we know Roy very recently joined the Justice League (but not how long ago he left Jay and Kori), but neither of these scenarios are explained in much detail. Lobdell doesn't give us that 'turning point event' which set Jason off on this future path. This isn't a bad thing, but it begs the question; assuming Futures End concludes with some time travelling mumbo jumbo undoing the future we just saw, will we see these other key events unravel? And if so, will that leave the question mark on The Outlaws? Oh, sorry; the outlaws. Jason mentions a divorce. Is this literal or figurative? It could just be “the team breaking up” or could there be a proper Earth-wedding in the intervening years? Where the hell is Vostrok? Are we supposed to recognize this location as a reference to something? Or did Lobdell just not want Red Hood in a real location? Maybe Vostrok is safely outside the range of KGBeast's rule? What exactly is a Heroplex? Is there more than one? IMMORTALITY. One dip in a Lazarus pit and Mr Todd is immortal? That's new. Maybe that's why this issue read a bit like a humorless Deadpool comic?